The specific practices outlined in this privacy statement apply to the AQHA UK website. Other bodies/entities linked to the AQHA UK website may have different practices, though the commitment to your privacy will always be the same. You are encouraged to review the privacy statements of other bodies/entities when visiting their website(s). In general, you can browse the AQHA UK website without disclosing any information about yourself. If you visit the AQHA UK website to read or download information, we collect and store only the following information that is automatically recognised: the date and time, the originating IP address, the domain name, the type of browser and operating system used (if provided by the browser), the URL of the referring page (if provided by the browser), the object requested and the completion status of the request. As described above, we sometimes collect anonymous information from visits to our site to help us provide better customer service. For example, we keep track of the domains from which people visit and we also measure visitor activity on the AQHA UK website, but we do so in ways that keep information anonymous. We use the information that we collect to measure the number of visitors to the different areas of our site, and to help us make the site more useful to visitors. This includes analysing these logs periodically to measure the traffic through our servers, the number of pages visited and the level of demand for pages and topics of interest. The logs may be preserved indefinitely and used at any time and in any way to prevent security breaches and to ensure the integrity of the data on our servers. Registering on the AQHA UK website is optional. If you choose not to register or provide personal information, you can still use the AQHA UK website. However, you may be restricted to what you can do. AQHA UK views the customer information that it collects as a valuable and confidential asset of which we take great care to ensure its safety. You may choose to register and receive promotional or marketing information from AQHA UK, by selecting the appropriate option when you register personal data. If you choose to register, your information will no longer be anonymous and will be available to AQHA UK staff and to delegations for the purpose of marketing. If you do not wish to continue receiving promotional or marketing information, please notify us by email at info@aqha.uk.com. We will make a sincere effort to respond in a timely manner to your requests to the previous questions or to correct inaccuracies in your personal information. At any time, you may request that we delete or correct your personal information in our logs. For such requests please contact info@aqha.uk.com. We intend to protect the quality and integrity of our personal information. AQHA UK has implemented technologies and security policies to protect the stored personal data of our users from unauthorised access, improper use, alteration, unlawful or accidental destruction and accidental loss. 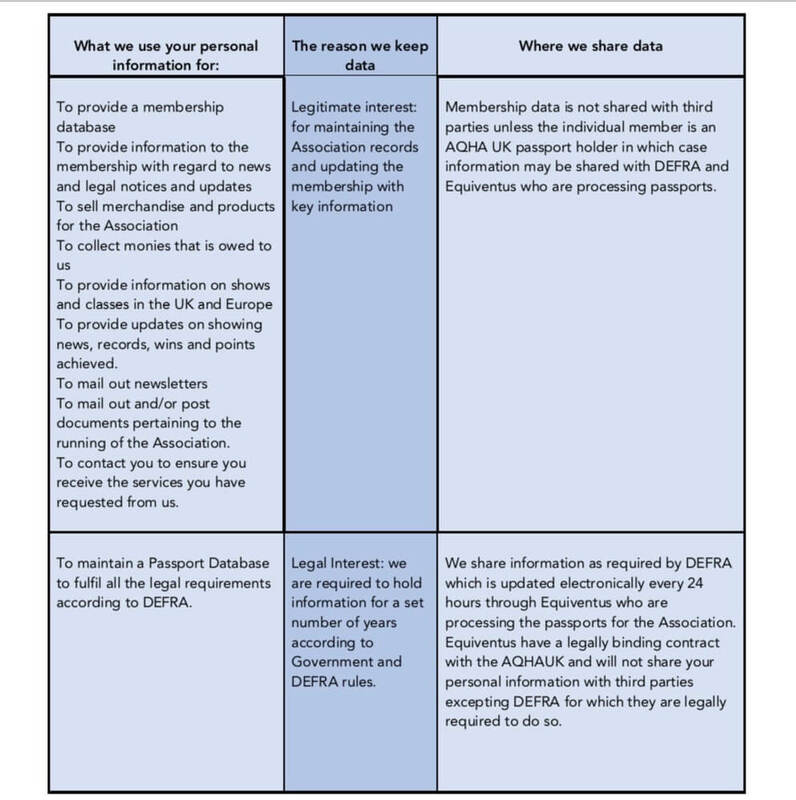 AQHA UK employees and processors who have access to personal data are obliged to respect the privacy of our visitors and the confidentiality of their personal data. AQHA UK will not sell or rent your personal information to anyone. Throughout the AQHA UK website, you will find links to third party websites. Please note that AQHA UK is not responsible for the privacy policies or content on third party websites. If you have any enquiries about our privacy statement, please contact info@aqha.uk.com.